Kitchen and Residential Design: Mad Men's coming! Here's the Dyna Moe version of me reporting for work at Sterling Cooper. Mad Men returns for its third season on August 16th and on AMC's website, there's an interactive tool that will allow you to Mad Men-ize yourself. Give it a whirl. I can't remember a TV show that's mesmerized me as much as Mad Men has. If you've never seen it, you have a couple of weeks to catch up on the first two seasons. It's funny, everyone I've introduced the series two has the same reaction. After seeing the first episode, everyone says "Gee, nothing happens. What's the point?" "Keep watching," I tell them. After the second episode they're hooked. 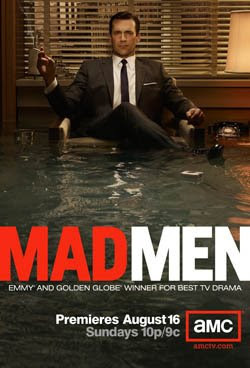 The action on Mad Men reveals itself in real time, nothing happens in the typical hour-long time frame of a TV drama. Stories arc over weeks and months and years and they pull me right along. Never has a group of unhappy narcissists (who look incredible by the way) strung me along like this. The sets are perfect and the action's set against the current events of the mid-1960s. The characters are so deliciously self-absorbed that few notice that the world as they know it is about to come crumbling down. I think though, what I appreciate most about Mad Men is the creators' steadfast refusal to inject any 21st century sensibilities into this period piece. The sexism and racism are blatant and disturbing. The lone gay character is trapped and miserable; he knows that his secret would ruin his career and life if it ever got out. Pregnant women smoke, everybody smokes for that matter. They smoke and they start drinking cocktails before lunch (at work). Their kids play with dry cleaning bags and sneak drinks. Mad men doesn't have a sentimental bone in its body, and in an alarming blast of real-ness, time unfolds without regard to who gets squashed. It's funny, by themselves none of these characters have any redeeming qualities. I take great care in keeping people like Don and Peter and Roger and the rest of them out of my life. Yet week after week I find myself sympathizing with who ever's the least reprehensible. It's great fun, really. 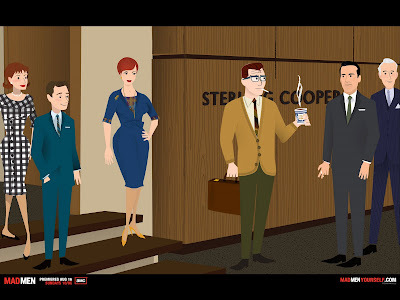 So go Mad Men-ize yourself and get ready for the return of the gang from Sterling Cooper. Sounds like another show into which we'll get sucked. Is it better than Breaking Bad? We are anxiously awaiting its release on BluRay so we can watch it at home. Oh Melody, it's in a whole different league from Breaking Bad. Mad Men is a story of self destruction told in slow motion against the backdrop of the early 1960s. In a lot of ways, the period of this period piece is its own character. Its story lines unfold over the course of years and watching it requires that you really pay attention --every aspect of the story means something and comes back into play, the audience just never knows when. Everything from the music in the background to the wardrobe selections advances the story. It's a drama made with such precision and purpose that there's really nothing to compare it to.